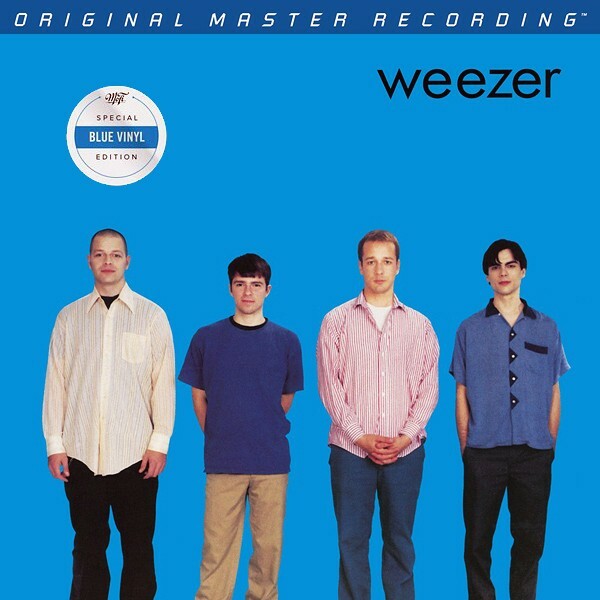 Weezer doesn’t look like rock stars, its amusing name doesn’t evoke stadium-heights glories, and the group’s lyrics don’t exude confidence or flash. For precisely these reasons, and the fact that the band’s songs on its self-titled debut are the stuff of air-guitar dreams and shout-it-out choruses, the quartet became stars equally celebrated by in-the-know hipsters and mainstream radio listeners. Numbered, Limited Edition Blue Vinyl Edition, Pressed at RTI. Superb, Room-Filling Sonics: LP Mastered from the Original Master Tapes. Rolling Stone 500 Greatest Albums of All Time - Rated 299/500 Rolling Stone 500 Greatest Songs of All Time - "Buddy Holly" - Rated 499/500. 1990s’ Ultimate Geek-Rock Album Made By and for the Everyman, Includes “Buddy Holly,” “Undone (The Sweater Song),” “Say It Ain’t So”. Mastered from the original master tapes and pressed on 180g blue-colored vinyl at RTI, Mobile Fidelity's analog version of the 1994 release Rolling Stone named the 299th greatest album ever recorded finally possesses the grand-scale sonics that the music's bunker-busting hooks deserve. Cars frontman Ric Ocasek's polished production is now both free of artificial ceilings that squashed the explosive dynamics and rid of the compression that saddled the frequency range. Instrumental separation is vastly improved, and the amount of midrange energy seemingly doubled. This reissue is guaranteed to help you rock out.